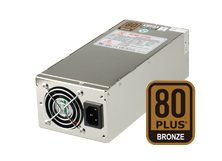 - Introduce the industrial graded SS-2U60EL Series power supply. - Design to fit perfectly into your 2U rackmount chassis. - Triple circuit protections and Active PFC. SS-2U60EL offer unswerving performance for your 2U chassis. AC Input Voltage Range: 100VAC ～ 240VAC, +/-10%, 47 to 63 Hz. * INPUT CURRENT:10.0 A ( RMS ) FOR 115VAC /5.0 A ( RMS ) FOR 230VAC. 0.98/115V 60 Hz and 0.95/230V 50 Hz. * Inrush current: 35A MAX. FOR 115 VAC / 55A MAX. FOR 230 VAC. 1. Noise Test – Noise bandwidth is from DC to 20 MHz. 2. Ripple frequencies greater than 1MHz shall be attenuated by the measurement System. 3. Add 0.1uF/10uF capacitor at output connector terminals for ripple and noise measurements. 4. The combined total power from 5V & 3.3V shall not exceed 180W. • COOLING: ONE 60mm DC FANS. • EFFICIENCY: TYPICAL >80% AT 115VAC, FULL LOAD. • MTBF OF POWER SUPPLY ELECTRONNIS: 100,000 hours at 25℃ 75% loading.